Nearly 40 years ago, sculptor Jim Sardonis had a dream. He saw himself standing on the shore watching two whales dance in the surf. The image of the pair of tails breaking the surface of the water as they dove into the depths of the ocean was frozen in his mind. The product of that dream, a sculpture of twin whales’ tails superimposed against the Green Mountains, will soon grace the Randolph landscape once more. The Preservation Trust of Vermont, paired with the Vermont Community Foundation, commissioned Sardonis this spring to recreate his 1989 sculpture, “Reverence”—and to do so at the sculpture’s original Route 66 location. The Preservation Trust, working with area activists, purchased 20 acres, including the former site of Reverence, from Sam Sammis in 2017. According to Paul Bruhn, the trust’s director, the idea of a public sculpture returning to the site was part of the group’s dream. With funding for the sculpture now committed from the Vermont Community Foundation, Sardonis is now poised to create a sculpture that fulfills his original vision. The new sculpture, Sardonis said Tuesday, will be called “Whale Dance” and, unlike the first iteration, which now resides along I-89 in South Burlington, the two tails will be cast in bronze. Bruhn noted that the Preservation Trust plans to donate a halfacre parcel to the town so that the new “Whale Dance” will be part of a publicly accessible park with strict protections guarding against the sculpture’s removal. 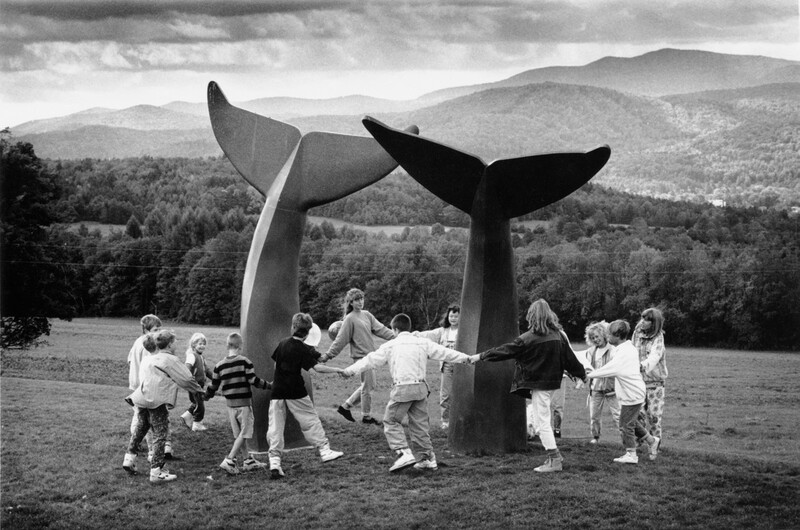 The original whales’ tails sculpture, “Reverence,” was installed in 1989. The commission came from David Threlkeld, a successful commodities trader in Randolph, who had originally planned for the sculpture to reside in front of his offices at Mari Castle in Randolph Village. Threlkeld asked Sardonis if he could carve the sculpture in stone and Sardonis found a black South African granite to work with. To accommodate the impala granite blocks, Sardonis made some adjustments to his original models. He built each of the self-standing sculptures in two pieces, one for the tail and one for the flukes. Each of the original tails was about 13 feet tall with eight-foot wide flukes. As work began on the sculpture, Threlkeld offered another location: a field he had bought near Exit 4. Threlkeld eventually sold that Exit 4 property to Sam Sammis. He found a buyer for “Reverence” as well—a group of developers who were creating an office complex and sculpture park in South Burlington. The famous whales’ tails have been installed at that park in South Burlington for longer than they were ever in Randolph. Despite that, local folks still think of Randolph as the sculpture’s rightful home and suggestions of bringing the whales’ tails back have regularly surfaced. Sardonis, who had been hired to oversee the move to South Burlington, said he felt that relocating them to Randolph would not be wise. The first move, he said, had been perilous. With no easy way to pick up the sculptures, Sardonis said that one of the tails had slipped free of its strap and nearly fell to the ground and shattered. “I wouldn’t even want to entertain the thought of moving them again,” he said. Sardonis’ whales’ tails sculpture has a history that predates the well-known original creation. He remembers sharing his whale tails dream with sculptor friends when he was in Carrara, Italy in 1981. In the country to find a piece of marble for the sculpture that occupies the main entrance to Gifford Medical Center, Sardonis described the sight of the two whales, water cascading from their outstretched flukes. To accomplish his vision, Sardonis had always hoped to cast the final sculpture in bronze. In doing so, he expected to have the needed fluidity of form, thanks to the strength of the metal. In 1984, Sardonis proposed the project to the Historical and Fine Arts Museum in Anchorage, Alaska. He brought the concept to a foundry in upstate New York and the people there were so thrilled with the idea, Sardonis said, that they cast his model free of charge. The Anchorage project never came to fruition, but it was seeing the cast miniature that prompted Threlkeld to commission the original whales’ tales. Sardonis said he has been excited to be able to give renewed attention to his original idea. The properties of bronze will allow for slightly more kinetic forms, he said. While Sardonis is still finalizing the design for his upcoming sculpture, he said the new Whale Dance is expected to measure 14-16 feet tall, with each fluke approximately 12 feet wide. Once Sardonis’ model is complete, he will take it to the Polich Tallix Fine Art Foundry in Rock Tavern, N.Y.—the same foundry that cast his original model. There, an enlargement of the model will be made and then the sculpture will be sand cast in pieces and welded together. A dark, mottled patina will be applied to the exterior. According to Sardonis, the finished sculpture will likely be installed near Exit 4 in May or June of 2019. President of the Vermont Community Foundation Dan Smith expressed his enthusiasm for “sense of common experience” that the whales’ tails had given the town. “We think ‘Whale Dance’ will be even more spectacular than the original,” Bruhn added.